It’s scary enough to see a large 18-wheeler bearing down on you on the Interstate; but even scarier to see that no one is driving. Autonomous trucks are going to have a serious impact on businesses, as they could replace corporate fleets for deliveries. Innovations in self driving trucks are poised to completely change the insurance industry by reducing accidents. We could see autonomous trucks reducing accidents by 80% in 20 years. 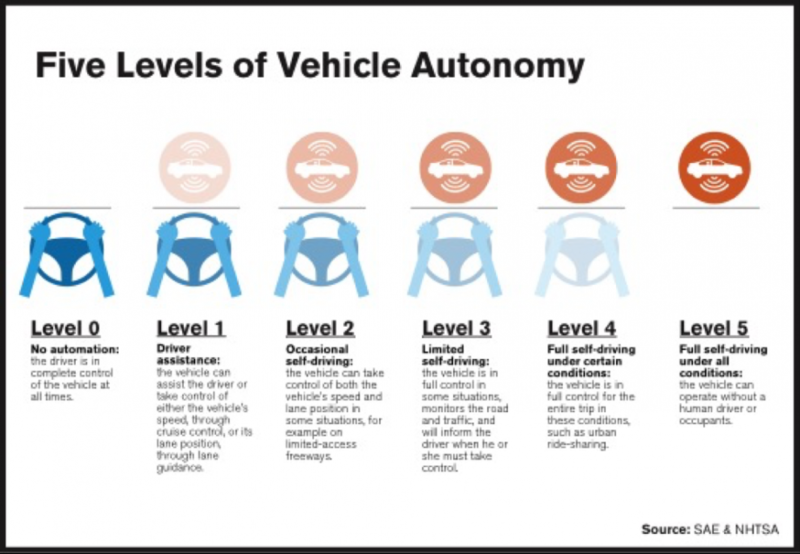 The National Highway Traffic Safety Administration adopted the Society of Automotive Engineers' levels for automated driving systems, ranging from complete driver control (Level 0) to full autonomy (Level 5). We should see Level 4 trucks on the road in next few years. The National Highway Traffic Safety Administration defines a Level 4 autonomous vehicle as one that can drive itself in most situations, except in bad weather or road construction, where a human will need to take over the driving. Having a truck drive completely autonomously in any condition is a great objective; but no one is close to achieving true Level 5 autonomy. There are still technical problems to be resolved; but those, who support the technology claim that self-driving trucks will be safer and less costly. As with all new technology there are risks. These vehicles will have to expect and defend against a gamut of malevolent attackers initiating cyberattacks. Trucks could be stolen by hackers or used as weapons. When Level 5 trucks become commercially available, there will be upfront costs, which will be expensive, adding thousands of dollars in annual costs for additional equipment, maintenance and specialized mapping services. There are many interactions on the road, which require many more decisions, necessitating more complex software then flying fighter jets. Autonomous trucks will undoubtedly cause accidents due to unanticipated conditions, including crashes that will harm other drivers. Yet, we will see positive safety improvements, as their crash rates should be lower than human-driven vehicles. Other features that will make autonomous trucks safer is “platooning.” This is where multiple trucks drive very close together to reduce road space requirements and wind resistance. When the lead truck brakes, all subsequent trucks will break immediately, eliminating the reaction time that a human takes to brake. This can reduce road space needed for multiple trucks up to 80%. Take a look at truck traffic on your local interstate highway, and you will see a lot of space between trucks. In Britain, they are experimenting with Platooning. Three vehicles will travel in a convoy. Each truck will have a driver who can take control if required (Level 2). The first truck in the platoon, will control the acceleration and braking of all three, using technology to improve the trucks’ trailing distance to reduce drag, which will cut fuel consumption and emissions. Road congestion will be eased, as the trucks will be as little as one or two seconds apart. In 2016, the Dutch government organized a challenge. A dozen trucks, manufactured by Volvo, Daimler and Volkswagen subsidiary Scania, traveled from their production bases in Sweden, Denmark, Belgium and Germany to their destination in the port of Rotterdam in the Netherlands. They traveled more than 1,243 miles and crossed four borders. Two trucks traveling 100,000 miles annually can save about $7,400.00 on fuel by platooning, compared to driving on cruise control, according to TNO, the Netherlands organization for applied scientific research. Autonomous trucks built and operated by the startup Embark have been hauling Frigidaire refrigerators 650 miles along the I-10 freeway, from a warehouse in El Paso, Texas, to a distribution center in Palm Springs, California. There is a human that rides in the cab, who monitors the trucks performance. This is Level 2 control with a professional driver sitting behind the wheel monitoring the road, supervising the system, and ready to take control at any time. The trucks have a custom designed dual-redundant real-time computer, which guarantees the accuracy of each command. Embark’s trucks run hundreds of self-tests every second to ensure that all systems are working as envisioned. DHL, which employees more than 500,000 across 220 countries, said it will begin testing self-driving delivery trucks in the second half of this year. DHL will equip some of its existing electric delivery trucks with new self-driving equipment from tech company NVIDIA and the automotive supplier ZF. The trucks will have video cameras, LiDAR and radar. The data gathered by these vehicles will help inform ZF’s ProAI self-driving system, teaching the AI to navigate along the delivery routes. NVIDIA DRIVE™ is an AI platform that enables truck makers to fast-track production of automated and autonomous vehicles. The company has four high performance AI processors, which can deliver 320 trillion deep learning operations per second. This will allow for Level 5 autonomous driving. Deutsche Post DHL hasn't revealed how many vehicles will be used; but said the move is expected to make its delivery service more efficient. The experiment will feature self-driving delivery trucks that follow a delivery person to deliver packages. The person wouldn't need to get back into the truck between dropping off packages; they'd just be needed to remove packages from the rear of the truck. Of course, we can’t speak of autonomous anything without the name, Tesla, being brought up. Tesla has a concept truck, which we have yet to see what its autonomous capabilities are. A version of the Autopilot driver assist system is sure to make the scene, considering that Tesla has all the hardware and software to make this happen. Will truck drivers survive the age of the algorithm? Are the days of the truck driver, as we know him, coming to an end? Trucking is a $700 Billion industry, where a third of the costs go into compensating drivers. The future of autonomous trucks is already here. Several states are laying the groundwork for these self-driving behemoths. California, Florida, Michigan and Utah have passed laws allowing autonomous trucks to drive in platoons. Truck drivers are not allowed to drive more than eleven hours a day without taking an eight-hour break; an autonomous truck can drive 24 hours a day. This effectively doubles the shipping capacity at half the cost. Of course, your kids can no longer signal a trucker to toot his horn for them.